As I mentioned, I am so happy to go with a midwife for this pregnancy. Even just one appointment has already made a world of a difference. When I told her I am borderline anemic, she recommended Floradix Iron + Herbs. I was really excited when I contacted the company and they agreed to sponsor the June Pregnancy Shopping Guide. They have sent me a generous six month supply of Floradix Iron + Herbs to last me through pregnancy. All I can say is, wow! What a difference! My daily prenatal multivitamins were already very helpful, but Floradix gives an extra boost of energy. The fact that it keeps me from getting lightheaded and fainting is awesome. Now I don't have to worry about fainting at the checkout counter at stores like I did with my last pregnancy. I still carry water with me everywhere, keeping hydrated keeps the lightheaded-ness at bay. I have also noticed that when I do take it (some days I forget), I have more energy toward the end of the day. Instead of feeling drained I feel like I can still do a load of laundry and wash the dishes. We all know that this can make a big difference! I like the way it tastes, though I imagine some people may not like it. It does taste very 'herbal', but not at all like medicine. I'll take this over any liquid medication any day! I also try not to take the second dose too late in the evening because it gives me too much energy and I have trouble falling asleep. I usually take it before breakfast and before dinner if it isn't too late (no later than 8 pm), I save lunch time for my prenatal multivitamin. At this rate, one 17 oz bottle lasts me longer than one month because I sometimes forget or skip the second dose of the day. Best of all of course, is that it is all natural and doesn't contain anything synthetic, any preservatives, or questionable ingredients. Also, most iron supplement can you leave you uhm, constipated (which would be a big problem for me since I already have trouble with that occasionally). Floradix is completely non-constipating and that is a huge plus for moms, especially if you have had such a problem after giving birth before. The price is a bit steep (you can find it as low as $35 for a 17 oz bottle), but consider it an investment into this new baby's health (and yours of course). Your money is better spent on this than a play yard or exersaucer for sure. Tell your hubby to skip the flowers and bring you a bouquet of Floradix instead! FLORA also makes a lot of other great products, we're already loving the Kinder Love Multivitamin that we'll be reviewing in the coming months. I also recently bought Udo's Infant/Toddler probiotics that we are using with success and quality that I know I can trust. MANDATORY ENTRY: [Follow us with GFC and] Tell us why you need Floradix Iron + Herbs or who you would give it to that needs it. For Floradix: Visit Required for Life and tell us what you learned. All Pregnancy Shopping Guide Giveaways end at 09:00 AM on Thursday, June 30th, 2011. Winners will be selected using Random.org and contacted via email in July. Open to US and Canadian residents 18+. My midwife also recommended Floradix for me when I was pregnant and it was great. I'm now breastfeeding and could really use it again! Visited Floradix site: I love that it's easier on the digestive system...this makes a lot of difference when your hormones are already playing with your body in pregnancy and breastfeeding! I take Floradix to keep up my energy, I've been nursing for 8 months and need every extra boost I can get! gfc follower as "sswpss" & I would give this to my cousin who recently had a baby and is tired all the time b/c she is borderline anemic. I learned that iron is required to produce the ATP our cells use for fuel & we get so we get tired when we don't have enough. "Just as a fire can't burn if we cut off its supply of oxygen, a shortage of iron in the blood means that our cells are deprived of the oxygen they need to burn the body's fuel"
Now I know why I need iron!!! 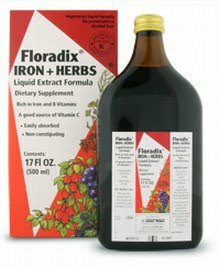 I am following with GFC and I would like Floradix Iron & Herbs because my iron is low monthly and I think higher levels of iron would help keep my moods more stable. I need this because I am a vegetarian who is often low on iron and I also have 5 kids to look after so I need my energy. I'm in my second trimester, and my iron has been borderline. I've seeen this recommended by several midwives, and I think It could really help my energy level! at the floradix site, I learned that low iron levels can lead to accumulation of toxic metals like lead. I definitely don't need that while pregnant! My midwife told me my iron was a little low a suggested Floradix Iron + Herbs to be prepared for labor and delivery for our upcoming birth of our precious blessing in August. At Required for Life website I learned that most pregnant women or 50% are found to be iron deficient during pregnancy and need a supplement and Floradix offers a vegetarian supplement that is easier to digest than pills. I have your pregnancy shopping guide button on my blog. I have your find a stoller button on my blog. I don't eat enough in my diet. My sister struggles with anemia and low energy , if I won I would let her try this and see if it helps. I publicly follow through GFC and I need floradix because I have had iron defiency (anemia) issues since my 1st born (6 yrs ago!). And I am now nursing my 2nd baby who is 15 months and can't really afford to buy any extra supplements. I have never tried this and really NEED to! I need it for me...i follow you on fb and here...i voted on picket fence and rate my blog....i learned that iron is important in production of blood.. something my doctors still cant figure out and think there must be a bigger issue with family member...this confirmed it. I am anemic and planning a pregnancy... I didn't even know I needed this! I'm so glad to have read this post. hemoglobin within red blood cells. I'd love it since i'm expecting. Approximately 40% of women of child bearing years are considered to have low iron status (ferritin 30 µg/L) (Millman 2003). More conservative estimates suggest that 9% - 11% of women of child bearing years are iron deficient,with iron deficiency anemia present in 2% - 5% of this population (Looker 1997). I'm also borderline anemic and haven't been able to donate blood about 50% of the times I try. Iron enables the blood to carry oxygen to tissues within the body! It also gives our blood its rich, red color!